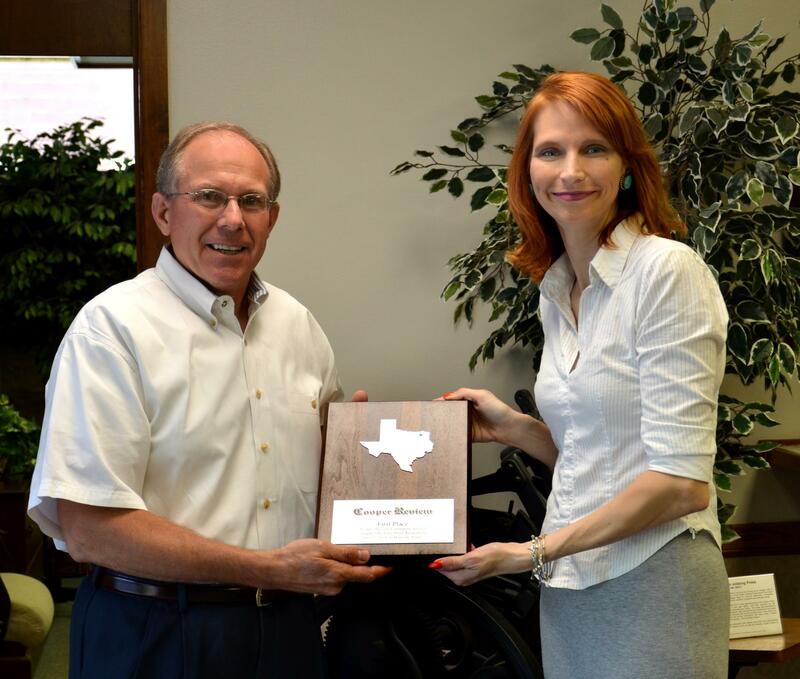 The Cooper Review has received five awards from the Texas Press Association’s 2013 Better Newspaper Contest. Cooper Review editor and KETR reporter Cindy Roller received first place for her Community Service submission featuring the Portraits of Valor. The feature series focused on local veterans and military personnel including James Lewis Reagan, Joe Tubb, Roger Moore and Thomas Vandygriff. The entry included a letter of testament regarding the series by Executive Persuasion Co-owner Pat Egert, formerly of the Red River Valley Veterans Memorial. Judging this year’s event, held in Houston on June 22, was the Arkansas Press Association. A second place certificate was presented to the Review for Page Design. The entry included the front page of the July 12, 2012 edition featuring the Cooper Rodeo, editorial page of the April 5, 2012 edition, faith page of the Sept. 6, 2012 edition featuring the 90th birthday of Truman Ratliff and the marriage of Jenna Stotts to Jason Leiker, and the sports page from Nov. 22, 2012 honoring the Bi-District Championship of the Cooper Bulldogs with a full page color spread of photos. “I love the package on the front. It’s very creative. My eye was drawn to it immediately,” noted the judges of the Division 9 Small-Medium Weeklies. The Review won two third place certificates – in the Editorial Division from submission’s by Roller including “From the Editor: Good Men” which was a recap of the TPA trip to San Antonio and “Ramblings of a Red Headed Editor” relaying the appreciation for readers and Cooper Review Football Preview in the Routine Special Section. The Review extends a special thanks to Luis Noble, Sulphur Springs News-Telegram Photo Editor, for his assistance creating the unique cover art which featured photos collaged into a silhouette of a football player. The Review earned fourth place certificate on the feature writing entry which included “eye-catching packages and headlines” on the “We Remember… 9/11 Tribute” story with a personal account from Delta County resident and Commerce firefighter Joe Martello and “Main Street Reception: History in the Making” featuring the wedding reception of Jim and Meredith Daniels on Main Street in Sulphur Springs. For more on this year’s winning entries by the Cooper Review see their Facebook page. 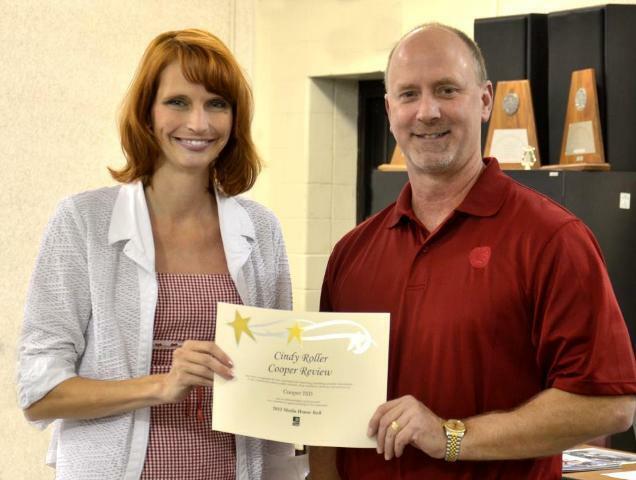 COOPER - The Cooper ISD showed its appreciation this week for local journalist Cindy Roller, who was named to the Texas Association of School Boards’ Media Honor Roll.